← How a candle-seller became a multi-millionaire? The three American veterans from three different wars had only one good leg among them. But that did not stop them from summiting Africa’s highest mountain. The three soldiers veterans of Afghanistan, Iraq and Vietnam scrambled, clawed and plodded to the top of Tanzanias Mount Kilimanjaro, hiking up the domed mountains scree-filled paths on one human leg and five prosthetics made of titanium and carbon fiber. The three amputees were from three different wars and two different generations with literally one good leg. They skidded. They fell. They removed their legs to adjust their shoes. And after six days, they stood at 19,340 feet Africa’s highest point. The message they were trying to send back to the USA is no matter what disability you have you can be active, said Kirk Bauer,the executive director of Disabled Sports USA and a 62-year-old Vietnam veteran who lost his leg in 1969. Bauer, of Ellicott City, Maryland,was one of the triumphant climbers. If three amputees with literally one good leg can climb Kilimanjaro,our disabled friends can get out and go hiking or go biking, can get out and lead a healthy life, he said. The youngest of the veterans,26-year-old Neil Duncan, lost both legs to a roadside bomb in Afghanistan in 2005.The Denver, Colorado,resident tried to summit Kilimanjaro last year ,but poor planning and a fast ascent schedule doomed the trip. While one was a Vietnam veteran, the other lost his limb in Afghanistan and the third veteran,Dan Nevins,a 37-yearold from Florida, lost his legs in Iraq. He developed a pressure boil on one of his legs stumps,which may have lead to his developing of a high fever, coughing and congestion. This time a different guide planned a route specifically for the veterans. The group took six days to ascend, instead of three or four, and a special permit for the disabled allowed them to spend the night in tents at 19,000 feet. Last Saturday they made it to the top. Climbing down was no easy task for the amputees After reaching the summit and descending to 15,000 feet, Nevins was evacuated down on a wheeled stretcher. Kilimanjaros lower paths are flat dirt, but higher trails turn to a rock and scree blend difficult for prosthetics. 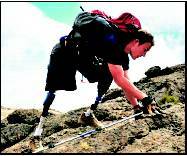 In the loose rock the artificial legs slid backward, leading Duncan to feel like he was climbing the mountain twice. Its an incredible amount of work as you can imagine but one of the most difficult portions of the whole deal was the ascent from 15,500 to 19,000 feet, said Duncan,a student at the University of Denver.The rocks were real loose, real steep. With having no feet or ankles I was lacking the ability to grip into that dirt. Going down the part many climbers say is the hardest on the body was no easier for the amputees. Duncan lost his footing and somersaulted. Bauers artificial leg fell off. I have only one real knee, and it takes an incredible amount of stress from falling, Duncan said. It was evidence that with the right planning and right preparation and right execution anything can be done, Duncan said. That was why I was so set on coming back. I knew it was attainable. It was proof that you can bounce back from a failure in anything. You can regroup, replan and use your previous experience and be successful. This entry was posted in Uncategorized and tagged adventure sports, army men injured, disabled climbing mountain, disabled mountain climbers, handicapped children, handicapped kids, handicapped persons success, handicapped soldiers, handicapped students, how to bounce from failure, how to win from failure, injured soldiers, mountain climbing, mountains, para gliding, physically challenged people, physically hurt, social welfare, soldiers, success of disabled men, success of mountain climbers, treking, you can achieve anything in life. Bookmark the permalink. This was one great inspiration Hari. I read it and wondered, why we normal, non-physically challenged people complain so much. Let’s learn from people who make life appear like a blessing!